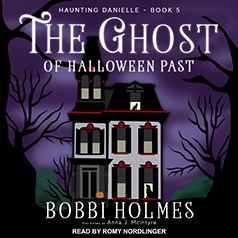 Bobbi Holmes presents the fifth installment in her Haunting Danielle series. Spending Halloween in a haunted house is nothing out of the ordinary for Danielle and Lily. After all, Marlow House Bed & Breakfast has its own full-time ghost. But there is another haunted house in Frederickport, Oregon. Yet, its ghost only shows up on Halloween. Why just once a year? And how is this frightening spirit connected to all that's happened to Danielle since she arrived in town? As Danielle tries to sort through the Halloween haunting, Sadie the golden retriever has her own issues—a mysterious cat who seems even more adept than Sadie at communicating with spirits.